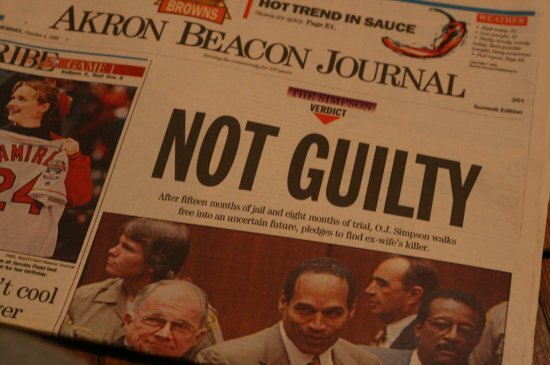 20 Years After OJ Simpson Murders Does Anyone Remember the Bankruptcy Case That Followed? It's been 20 years since Nicole Brown Simpson and her friend Ronald Goldman were brutally murdered in the summer of 1994. You no doubt remember the infamous low-speed white Bronco chase with dozens of LAPD in pursuit of accused killer OJ Simpson. Then came the trial and the not-guilty verdict which was hailed by some and caused outrage in others. In case you tuned out after the criminal trial, there was a civil trial two years later where Simpson was found guilty of murdering his ex-wife and Goldman. The jury awarded Goldman's family $8.5 million in compensatory damages and another $25 million in punitive damages to the Browns and Goldmans. It was this huge $33.5 million financial judgment that led to the Simpson bankruptcy case, which likely would have gone largely unnoticed had it not been for a book that Simpson wrote and sought to publish. Long before OJ Simpson was in court over the death of his ex-wife, he was a well-paid athlete. When he played in the NFL, Simpson set up an ERISA retirement account that, at the time of the civil judgment, was worth $4 million. The judge in the civil case ruled that the Goldman and Brown families could not access that retirement account to satisfy what was owed to them. Simpson also owned a substantial home in Florida and that state has excellent asset protections, including unlimited homestead exemption. By comparison, in our state, only $35,000 of home equity is protected. That meant that his Florida mansion was also untouchable by the victims' families. Simpson moved to Florida after the verdict, trying to outrun the millions in debt, and he largely succeeded. He later lost that home to foreclosure for failing to maintain payments during his Nevada imprisonment on criminal charges unrelated to the Brown Goldman murders. After his acquittal, to try and make some money, Simpson penned a book titled “If I Did It” that laid out how he would have committed the murders if he had done so. He set up a corporation called Lorraine Brooke Associates that signed a deal with publisher Harper-Collins to print and sell the book. There was also a TV special based on the book that was to air on the Fox network. The company he formed was paid $890,000 for the book and Simpson said he received and spent the money, claiming he had the right to earn a living despite the large judgment against him. Simpson then attempted to bankrupt the company he had formed to try and shield the profits from the Goldman family and his other creditors. The bankruptcy court ruled that the company was formed for fraudulent purposes and the bankruptcy judge gave the Goldman family the right to sell the book and keep 90% of the profits. Initially the families were conflicted about the publication of the book but, ultimately, Goldman's father decided to push for publication because he felt it was Simpson's only public admission that he committed the murders. To date, the families of the victims have received no money from OJ Simpson for the civil judgment awarded them for the wrongful death of their loved ones. Simpson is currently incarcerated in Las Vegas for an armed robbery conviction and won't be eligible for parole until 2017. Click here to read our top celebrity bankruptcy cases. Contact the law offices of John T Orcutt for a free bankruptcy consultation at one of our convenient North Carolina locations. We want you to have the financial fresh start you deserve. Call today to get some peace of mind.